The area where La Villita Historic Arts Village (“La Villita”) stands today has been occupied by humans for centuries. Prior to the arrival of the Spaniards, that are on the shore of the San Antonio River had been home to a community of Coahuiltecan Native Americans. Around 1722, the soldiers from the Presidio (the Presidio was where Military Plaza and the San Antonio City Hall are today) lived in huts on that site with their families. That community was later destroyed by a flood. Then, in the early 19th Century, a group of immigrants from Germany built more permanent structures on the site. The Germans were followed by immigrants from Switzerland, France, and Italy. These are the buildings that are there today. As with so much of the historical sites of San Antonio, the buildings of La Villita fell into disrepair. During the Great Depression, the buildings were restored to their original condition, and La Villita began its current life as an arts center. Today, La Villita is home to shops, galleries, and restaurants. Several festivals are held there, including the Fiesta event, A Night in Old San Antonio (popularly called by the acronym “NIOSA”). My family and I also attended the India Association of San Antonio’s annual Festival of India at La Villita in the early 2000s. Even though this information will be outdated in a couple of months, the 2016 festival will be held on March 26. I do not know if it will be held in La Villita again, though. 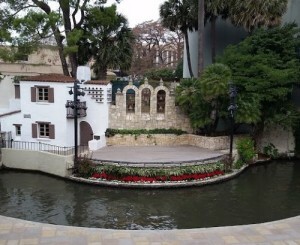 The Arneson River Theatre abuts La Villita on the San Antonio River side. 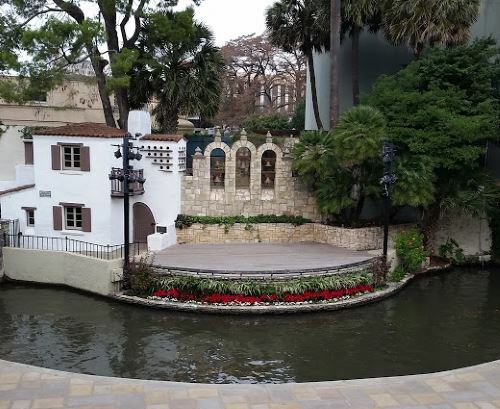 The theater is set up in an unusual but picturesque way, with the audience seating on the La Villita side and the stage on the other side of the river. The streets of La Villita are level, but not all of the shops are wheelchair accessible. The Arneson River Theatre has steps leading down to (or up from, depending on your perspective) the river, but I am pretty sure that there is wheelchair accessible seating at street level.